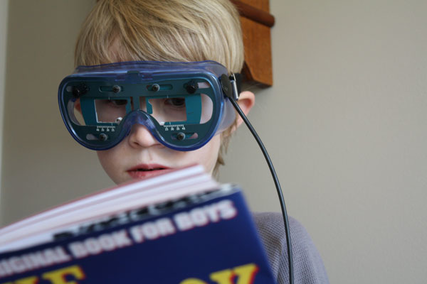 Children who are having difficulties in various areas of learning may also have functional vision problems. Visual therapy trains the entire system, which includes the eyes, brain, and body. The goal of this therapy is to habituate a patient’s brain to use the eyes to receive information efficiently, to comprehend it quickly, and to react appropriately. During vision therapy sessions, the patient learns various exercises and games to repeat throughout the week at home. Initial sessions focus on enhancing the brain’s ability to control various functions of the eye such as visual speed, eye mobility and coordination, and movement accuracy. Subsequent sessions develop endurance through repetition while integrating additional skills. Dr. Liesl Kaye and Denise, Vision Therapist, combine efforts to provide specific patient care and detailed sessions for each specific child. The child is observed and then individualized activities are created to address the problems that have been encountered in their evaluation. Activities are repeated, challenged, and changed to help the child make the most progression throughout their sessions.